This is a time which we always enjoy (and usually feel we rather deserve!) . 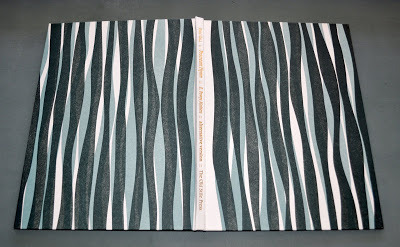 . . when a book has been completed and photographed and some promotion has been designed and despatched. In the old days this involved a physically-printed card or leaflet and it was the postman who brought replies, the whole process taking quite a time. In the computer age, however, things are very different. Once I have completed a leaflet with photographs and the necessary facts, Frances will do her wizardry with her address list and the thing will whizz off in all directions. Results are almost immediate but seldom very productive at that early stage . . . involving such automatic information as the fact that suchandsuch librarian halfway round the world is on holiday for two weeks! One has to wait a bit longer for the joyful bit, the “that looks really good, yes please I would like to order a copy” sort of reply. Happily there has already been a goodly number of such reactions so we are relaxing a bit when thinking about our considerable investment this time and feeling that all the labours were justified. So, what is this project about which I have said so little here or elsewhere? 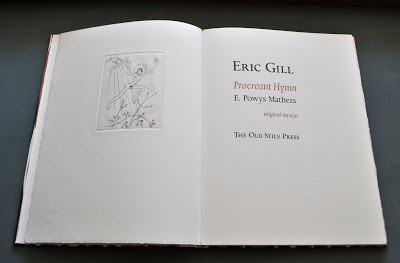 When, in 1926, Procreant Hymn, by E. Powys Mathers (1892-1939), was published by Robert Gibbings at The Golden Cockerel Press, there were printed 175 numbered copies for sale with a further 25 copies for presentation. There was also a notice, loosely inserted at the end of the book, which stated ‘Subscribers may be interested to know that three alternative designs have been engraved for this book and may be obtained separately from the artist’. 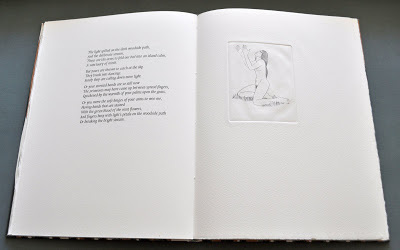 In the publication there are five images, all copper engravings by Eric Gill. These are known to be titled God Sending, Earth Waiting, Earth Inviting, Dalliance and Earth Receiving – although the titles are not printed in the book. As advertised in the notice, Gill made alternative plates, although there were actually four of these rather than three. They basically follow the composition of the published versions but the male and female figures, already naked in the published versions, are presented in a state of realism which would clearly have been unexpected (and, in many quarters, unacceptable) at that time. We at The Old Stile Press have been entrusted with all the copper plates that Eric Gill engraved for this book and we have decided that the most interesting form in which we can make them available to book collectors, is to provide two complete copies of the book – one following the model of the Golden Cockerel book (now hard to track down and expensive) with the other breaking completely new ground by substituting the alternative plates to produce a book that has never been seen before. Our books follow the pagination of the Golden Cockerel book but uses a much larger page and, importantly we think, are set in Aries, a beautiful and little-known typeface designed by Eric Gill himself. by Martyn Grimmer, Masterprinter at Spike Print in Bristol. The paper is 200gsm Vélin Arches Blanc and the type is Aries. 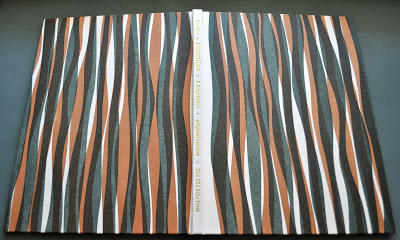 patterned papers designed and printed by Nicolas McDowall. together with 15 copies hors commerce. the price of the complete item will be £850 plus p&p. Thereafter it will be £950 plus p&p. 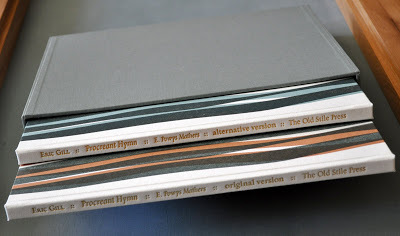 and here is how the books sit within their slipcase. If anyone wishes to hear more, please email.